President Andrews at the Capitol Building in Washington, D.C.
Every day, I’m reminded of the importance of education in our society. National University’s founding mission, to serve the unique needs of lifelong learners, inspires me to explore new pathways and solutions that make a big impact in the lives of students, their families, and in their communities. 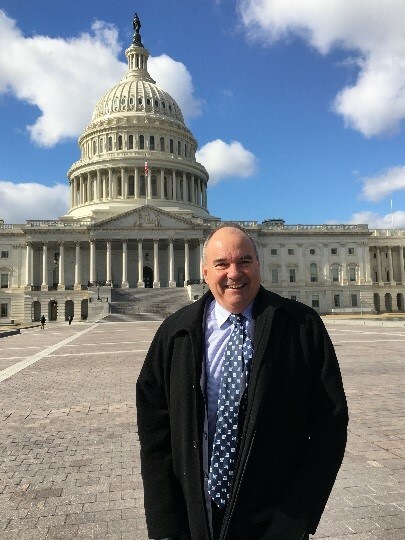 During a recent trip to our nation’s capital, I met with various government officials to discuss the innovative ways we serve the adult learner population, which accounts for nearly forty percent of all college students. A key component to providing lifelong learners with quality education is to be flexible to meet students where they’re at in life, thus making market-relevant programs accessible within demanding schedules of adults who have careers, families, serve in the military and maintain many other responsibilities. NU is well-equipped to adjust to both student needs and workforce demands by employing advanced technologies and data analytics to create a more customized learning experience adapted to the needs of individual students, guiding them to successful completion of their academic and career goals. We recently partnered with the San Diego Workforce Partnership and San Diego Regional Economic Development Corporation to launch a discussion about the use of big-data techniques to bring greater efficiency to education, workforce training and the regional infrastructure, thus enabling smoother transitions from higher education into quality jobs and careers. More than 300 community leaders gathered to hear world-renowned economist Dr. Raj Chetty’s research on inter-generational mobility, housing, neighborhood policy, education and college persistence. Dr. Chetty’s presentation on “Creating Conditions for Economic Mobility,” aligns with the Precision Institute’s use of data science to provide evidence-based tools, such as asynchronous learning, to be more effective in meeting students’ needs. Check out my recent blog post on the Precision Institute website to learn more about personalized learning. 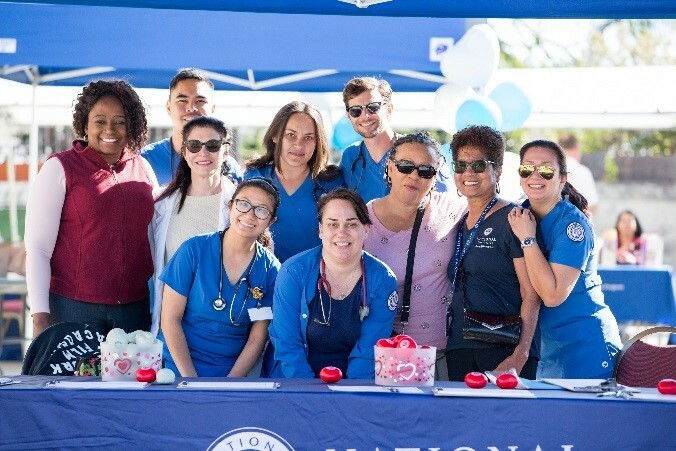 NU nursing students at SHHS “Healthy Hearts” wellness fair in Los Angeles. Each day presents a new opportunity to engage in lifelong learning. In February, which is American Heart Month, one of our Los Angeles-based Nurse-Managed Clinics, run by the School of Health and Human Services, hosted a neighborhood wellness event to promote “healthy hearts.” Nurse practitioners, student nurses and my wife Marti, whose background is in health and human services, shared information about nutrition and provided much-needed healthcare services in the community of Watts. I’m very proud of SHHS for the positive impact they are making in the City of Los Angeles through their dedication to this program. Launch of the Institute for Leadership Synergy at National University. As we work to empower students and local community members, we recently launched our Institute for Leadership Synergy at National University to empower and train more women to lead in business, government, education, nonprofits and start-ups. 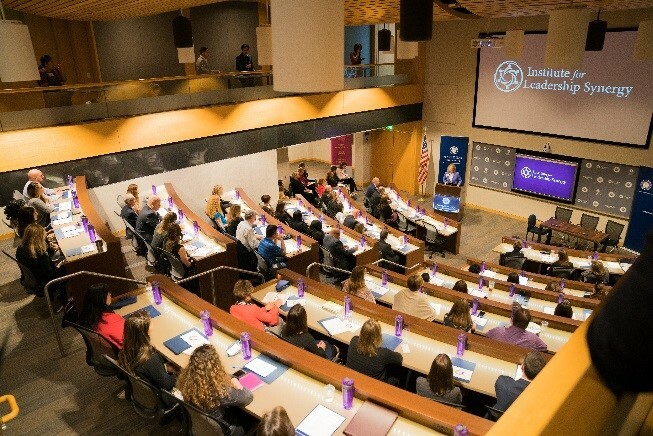 The Institute incorporates a unique emphasis on educating and equipping both women and men to employ the evidence-based principles of “gender synergy” to create more collaborative and effective workplace cultures by leveraging the leadership styles and contributions of both women and men. This Institute wouldn’t have been possible without the wonderful leadership of Adriana Cabré, Institute co-founder and Vice Chancellor of Human Resources for National University System; Joylyn Darnell, Institute Executive Director and Institute co-founder Will Marré, who I am saddened to say, recently passed away. Will was the creator of the SMART Power Academy, and was instrumental in bringing the “7 Habits of Highly Effective People” to millions worldwide. He affected transformational change in those who were fortunate to know and learn from him. He is dearly missed, and our sincerest condolences go to his family. I want to thank everyone in our NU community for their commitment to serving and empowering others and to being lifelong learners who continue to positively impact our society.